GoBankingRates.com explains the crucial steps car shoppers need to consider this Labor Day to walk away with the car of their dreams at an affordable loan rate. Dealerships often prey on car buyers’ expectations that all deals are good deals -- which often, they are not. Labor Day weekend is a time when car dealerships are anxious to sell current inventory and make room for next year’s models. 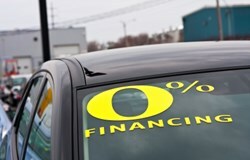 To help car seekers get the best deals on 2013 models this weekend, GoBankingRates.com outlines the most important financing factors to consider before evaluating loan options. “Labor Day weekend is one of the biggest car-buying seasons of the year, but shoppers looking to get a good deal need to be careful. Dealerships often prey on car buyers’ expectations that all deals are good deals -- which often, they are not,” said GoBankingRates.com managing editor Casey Bond. 1. Be wary of 0-percent dealership financing. GoBankingRates.com cautions buyers to be wary of advertised 0-percent financing options, as they normally limit one’s ability to negotiate on the price of the vehicle and often are applicable only for short-term contracts, meaning monthly car payments will increase as a result. 2. It’s rare to obtain both zero-percent financing and cash-back incentives. Cash-back offers are often available during Labor Day and other big holiday sales; however, it’s rare to obtain both cash back and 0-percent financing. Although cash back is usually unrelated to credit score, anyone who qualifies for 0-percent financing will likely not obtain cash back in as well. 3. Interest rates are often lower at banks and credit unions than at the dealership. GoBankingRates.com notes that interest rates are often lower at banks and credit unions than at the dealership. However, loan availability at financial institutions could be stricter due to the lack of revenue from the car sale itself. GoBankingRates.com recommends buyers conduct research on interest rates and obtain their credit score before setting out to purchase a new vehicle this Labor Day. To find out the average auto loan rate in your area, please visit http://bit.ly/153no2L. For more tips on auto financing, please view the complete Labor Day auto financing guide, which also explains zero-down payments, negotiation leveraging and qualifications for different interest rates, at http://bit.ly/12IWjB5. Before making a car purchase this Labor Day, GoBankingRates.com urges car shoppers to review the best cars deals available now at http://bit.ly/15d06dK.